Our Breathe Easy Essential Oil Blend diluted in Massage Base (ready to apply). This blend is mildly stimulating and may keep poor sleepers awake if used before going to bed. If this is the case, we suggest using this blend during the day and lavender oil by itself at night. 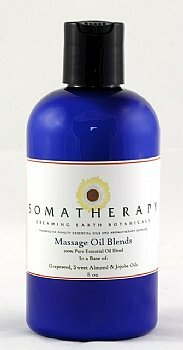 Premixed in our Massage Base oil, this blend may be applied directly for a soothing massage or add a cap full to a warm bath. A blend of 100% pure Essential Oils: Eucalyptus, Lavender and Peppermint in our Massage Base oil (a combination of Sweet Almond, Grapeseed & Jojoba oils).